With the help of a grant from the BJF, I spent a week in a small community in Chiapas, Mexico working with Grounds for Health, a non-profit organization that provides sustainable cancer prevention programs to workers in coffee growing co-ops in underserved areas across the globe. I was part of a team that provided cervical cancer screening to women who presented to our temporary clinic in Nuevo Paraiso. During the week of our visit, over 350 women traveled over long distances from remote areas and waited patiently for their turn to be evaluated. Since the advent of the Pap smear in the 1940s along with structured screening programs, the incidence of cervical cancer in industrialized countries has seen a dramatic fall. This is not the case, however, in the developing world, where cervical cancer continues to take a toll on women because this simple screening is not readily available. We processed, stained and reviewed samples on site under the microscope. Women with pap smears indicating a significant lesion were immediately sought out and treated with cryotherapy on site. This unique "see and treat" approach allowed women who traveled to the clinic from near or far to be evaluated, screened and treated in one visit, thus significantly reducing costs and the potential for loss to follow up. 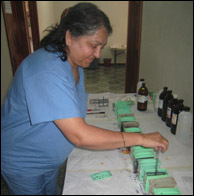 In addition to the conventional Pap smear we also did VIA (Visual Inspection with Acetic acid). During the course of the week we trained the local providers to be able to use the VIA technique as a sustainable screening method in this remote area, in the absence of fully-equipped and staffed laboratories. I am grateful to the Benjamin Josephson Fund for allowing me to use my expertise to serve the people of Nuevo Paraiso. I came back with a fresh perspective, feeling extremely rewarded and humbled by their grace, gratitude and friendship.